The Cobweb Orchestra can be booked for events. The Cobweb Orchestra is completely open access, but it has among its membership many experienced players, some of whom perform in smaller versions of the orchestra. Andy Jackson’s ‘White Water Music’ for wind, brass and percussion was specially commissioned to celebrate the opening of a new section of the Tees Barrage in Stockton in 2012 by the Her Majesty The Queen as part of her Diamond Jubilee tour of the UK. There are also off-shoot groups who help to raise funds for the orchestra. The Cobweb Cabaret Ensemble is a flexible group of around 10 to 17 players offering sophisticated entertainment for concerts, private functions and events. 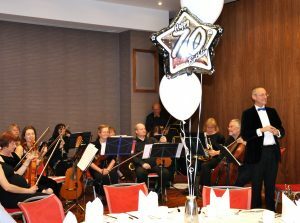 They play a wide range of music to suit the occasion, from classical and jazz to popular and Latin American numbers, with much of the repertoire especially arranged or composed by Andy Jackson, who directs from the trumpet. The Cobweb Cabaret Ensemble also sometimes performs with the celebrated chanteuse Bridie Jackson. 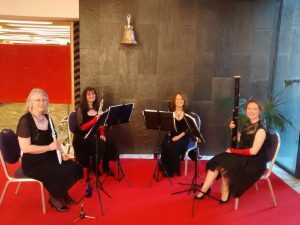 Previous performances include a concert in Hall 2 at The Sage Gateshead and playing for the Friends of Alnwick Gardens and Beamish Museum, as well as delegates at the 2012 Making Music Conference in Cardiff. 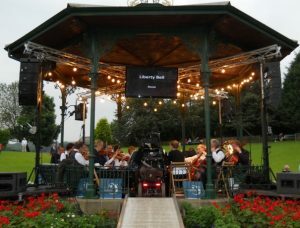 The National Trust commissioned the Cobweb Cabaret Ensemble to record Franz Lehar’s ‘Gold & Silver Waltz’ for a CD for visitors to Lyme Park in Cheshire. The Cobweb Chamber Orchestra has around 35 regular players, although the music does not require trombones (sorry trombonists!). It has performed in beautiful venues such as Ushaw College, Aysgarth Church, Bowes Museum, and Preston Park Museum. Sometimes concerts have a theme, such as an evening of pieces by Spanish composers or music from Bohemia. The Cobweb Baroque Ensemble is a group of between 7 and 12 string players who enjoy playing music from the 17th and early 18th centuries. Much of the repertoire is by Vivaldi, Corelli, Handel and Bach. They play without a conductor, directed from the first violin. They are available to play for organisations and functions such as weddings.